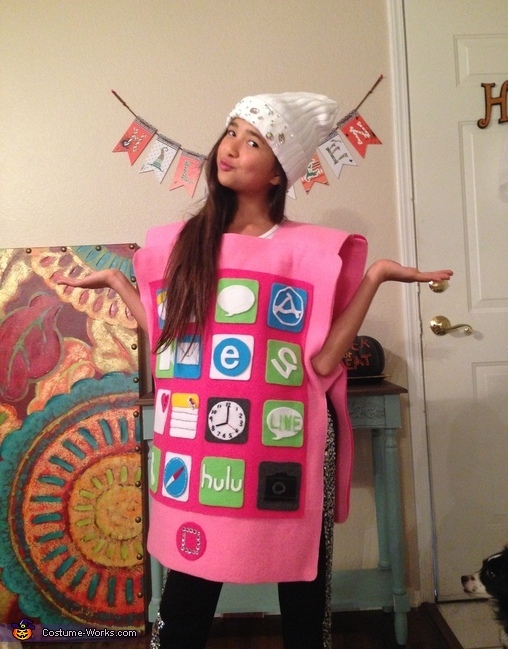 My daughter Julia is wearing her pink iPhone costume! I asked my 11 years old daughter Julia one day "what do you want to be for Halloween?" She answered me "iPhone" so i made this pink iPhone costume for her but my friend said, "maybe she thought what do you want for Halloween?" "Oh---, could be!!" She is entering into teenager! But she loves the pink iPhone with a lot of details like little stitches for safari and clock! can you describe how you made this costume? and what material did you use?